Do you love to read before bed? When my kids were little, I read to them every night before bed and scary stories were always the favorite. I love to read scary stories at lunch, before breakfast, before bed…well anytime. My type of scary has more suspense in it than gore, and a slight twist of dark humor. All of the authors and books I recommend fit my requirements for scariness at it’s best. Before you begin you need a few things to make the experience just right: a big mattress, a blanket to throw over your head, a teddy bear to squish, and scary voices for each character. Bundle these all up together and you’re set to have these stories add to your perfectly scary Halloween. Boo. Afraid of the dark? I mean who isn’t afraid of the dark? What lurks in the closet or under your bed? The story begins with: “The dark lived in the same house as Lazlo, a big place with a creaky floor, smooth, cold windows and several sets of stairs.” I’m already scared. Aren’t you? Read it to the end, and find out what the dark has to say. Okay, well I have to say this is my ALL TIME FAVORITE. Did I mention I wrote this one? Jerry, has a problem…monsters. They are everywhere and no one believes him. 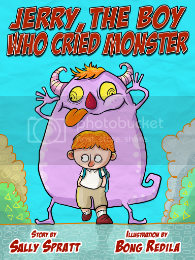 The monsters mess up his room, eat his homework and even try to eat the class hamster. This is a fun but still scary book. 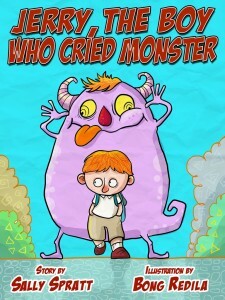 because it has monsters in it, e-book available in the Houghton Mifflin Harcourt book app called MeeGenius. Don’t want to read alone? Turn on the narration and have it read to you. The Zombie Chaser Series by John Kloepfer. A 7 book series full of zombie chills and guts. 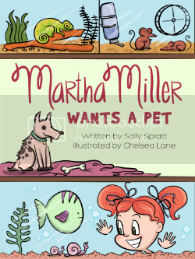 Book one drops you into the story of Zach and his best friend, Rice along with the mean queen Madison. Everyone in the world around them is changing into ZOMBIES, includes Rice’s sister. Its’ up to these three to survive and save the world. Can they do it without getting turned into zombies themselves? I don’t even have to say this is scary, the title tells you all. Plus it’s written by a ghost named Derek. This is the first in a 3 part series (so far). 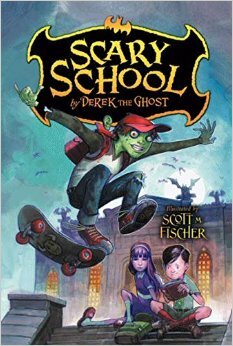 Derek is a ghost, he’s 11 and he died in science class when one of Mr. Acidbath’s experiments went horribly wrong. Derek walks you through the school where your homeroom teacher is Ms. Fang and T. Rex is there to help you through detention, if he’s not too hungry. There’s a web-site filled with scary stuff, fun and games: www.scaryschool.com. What are your favorite scary stories? How do you prepare? Do you read on your bed under tucked under the blankets? Maybe you read UNDER the bed? “Stop That Frog!” is the perfect little chapter book for your early reader. An added bonus the publisher Grosset & Dunlap has used a font called Dyslexie. The Dyslexie font was designed by a graphic designer specifically for dyslexic readers. It makes it easier for them to read with out jumbling, inverting or flipping the letters. The font will encourage dyslexic readers not to give up, they’ll be able to reader faster with less errors. It’s not all about the font either, Hank is one of those kids that most kids can relate too. He is a little bit impulsive, a little forgetful, some may use the label ADHD. But, Hank is a fun kid with brilliant ideas and a kind heart. 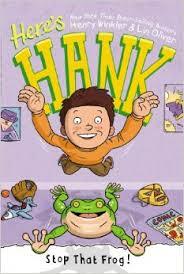 In this book of the Hank series, Hank is chosen to take care of the principal’s frog for the weekend. It’s a big job and a lot of responsibility. There are few rules and things Hank can’t forget, like putting the lid back on the cage. Can Hank do the job? He does fall into a little trouble, when he forget to put the lid back on, even after a lot of reminders (it’s Hank’s world). But in the end his friends and family come to his aid and the frog is safe, and everyone is happy. If you have a struggling reader, this book is perfect. If you have an avid new reader who just can’t get enough books, add the Hank series to your to read list. 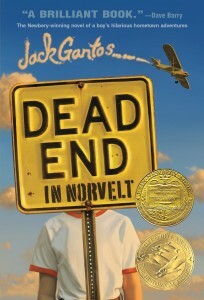 I loved, loved, loved “Dead End in Norvelt” by Jack Gantos. This is a perfect book for your middle grader boy or girl. I’m not sure what category it falls into: historical fiction, humor or mystery because it has all three. 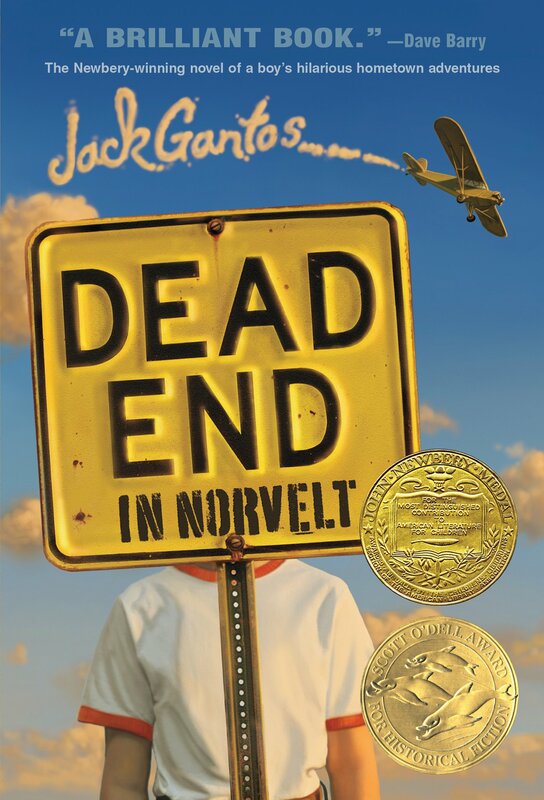 Jack does a wonderful job depicting life in Norvelt, and it just happens to be about a boy named, Jack Gantos. It’s the start of summer vacation, and Jack gets caught in the middle of his dad’s schemes and his mother’s quest to help those less fortunate and suddenly Jack is grounded for life. Part of Jack’s punishment is he has to help the old neighbor lady with a mysterious chore. Turns out he helps her by typing up obituaries which are filled with stories of the founding members of Norvelt who are dying off one by one. Throw in some rat poison, Hell’s Angels, a man rides a trike, a WWII Japanese rifle, constant nose bleeds and Jack’s dad building a landing strip and bomb shelter…you’ve got quite a story. Jack throws in some history, which doesn’t make it seem like you’re actually learning anything. And perhaps there is a murder or two, maybe three. Jack has a clever witty style of writing that doesn’t talk down to kids. The fact that this is based on his own life and the real town of Norvelt makes it even better. I’m looking forward to reading “From Norvelt to Nowhere”. 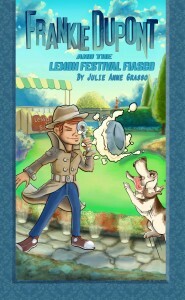 Frankie is at it again in “Frankie Dupont and the The Lemon Festival Fiasco“. Quick paced story jumps right into the action. The author, Julie Anne Grasso has crafted clever and quirky characters that kids will enjoy. 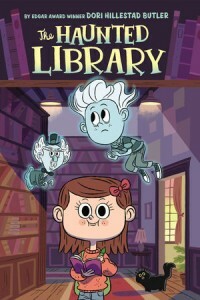 In this episode Frankie starts by trying to find out who put poison in the lemon pie after the head master is unknowing given a piece of the pie. Then, the lemon trees at Enderby Manor begin to die right before the Lemon Festival, putting the festival at risk. Frankie with the help of his friends, Kat, Lachy and Frankie’s faithful dog gets to the bottom of the mystery. Frankie uses clues, his investigative tools and skills he learned from his parents to find out who done it. 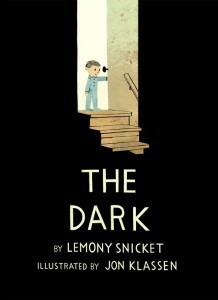 Although, he does jump to a few wrong conclusions, the mystery keeps moving forward and keeps the young reader engaged. I’m not a fan of the artwork inside, but I think any middle grade reader (boy or girl) will enjoy this book. To purchase a Kindle copy click here. To find out more about the author Julie Anne Grosso and her other books click here. Perfect little chapter book for an early reader. A.J. hates school. What he really loves is football. A.J. can see no reason to go to school if he’s going to be a football player when he grows up. But, as much as he hates school, he finds it a little strange that his new teacher, Miss Daisy can’t read, write or do math. She’ is the dumbest teacher in the history of the world. A.J. and the rest of the class come up with a plan to buy the school and turn it into a video-game arcade. Who needs school…right? 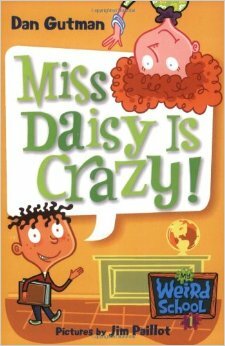 The real question is, how did Miss Daisy become a second grade teacher if she can’t read, write or do math? 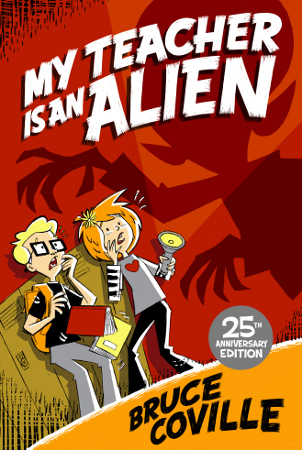 Book 1 in the Weird School series. Your young reader will enjoy Dan Gutman’s humor and Jim Paillot’s illustrations. Beautiful story with gorgeous artwork by E.B. Lewis. Winner of a Correta Scott King Honor award. Jacqueline wove a story around a new girl, Maya, who arrived at school with clothes from last season. But the story isn’t about Maya, it’s about how Chloe and several other classmates treat her. 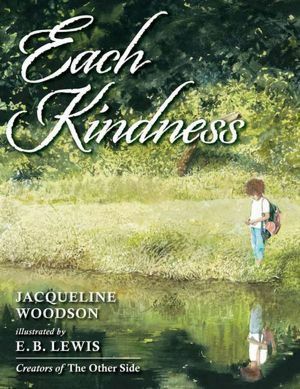 One day Maya is gone and the teacher has a lesson on each kindness we do. She gives a simple demonstration with a pebble tossed in water, and the ripples it causes. The ripples are each kindness expanding out. One little pebble, one kindness, has an effect far beyond it’s original point. This causes Chloe to second guess her actions toward Maya. She wants Maya to come back so she can start over, share some kindness. Buy Maya doesn’t return, and Chloe doesn’t get a second chance. Although this is touted as an anti-bullying book. I will say it’s more about being kind to those around you. There is no way to tell what that person is going through. Just because someone doesn’t wear new clothes, and perhaps doesn’t have money for lunch -doesn’t mean they don’t deserve kindness. Once the opportunity has come and gone, you may not get a second chance. It’s a gentle and subtle reminder. Available on the MeeGenius! App. 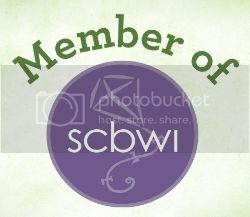 Please subscribe to my blog here.